Leaking gutters can cause expensive repair bills. Joint failure is predominantly the cause along with corrosion. Gutters can also become overwhelmed during storm conditions if obstructed by debris from trees or droppings, hence it is advisable to have them cleared on an annual basis. Repairing guttering is considered as a short term fix. The permanent solution is to install hard wearing uPVC guttering from Kingston Roofing with a 10 year ,no rot guarantee. Call the professionals today on 0208 226 4656 to organise a free site visit to discuss your requirements. 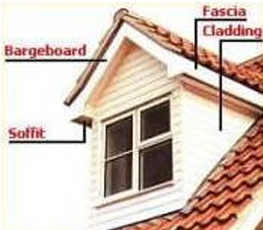 Soffits support fascias and provide ventilation to the roofs of centrally heated homes. Without this ventilation condensation can form and increase the risk of timber decay. Kingston Roofing supply and install flat and fluted uPVC soffits, along with cladding in a range of colours and various venting systems. Call our team to discuss your requirements on 0208 226 4656. Customer satisfaction is very important to Kingston Roofing, our highly skilled and experienced roofing teams are directly employed, we do not use sub-contractors so you can rest assured that your project will be handled professionally and efficiently from start to finish by ourselves. Call us today, we will beat any quote, like for like! We do not take any deposits upfront. Our clients are happy to pay in full when the job is fully completed and to their satisfaction. With offices in Kingston and Egham, we are able to offer our comprehensive range of roofing services throughout Surrey, the whole of London, Berkshire, Hertfordshire and Buckinghamshire.